The Denison Rink, Mount Dennis. 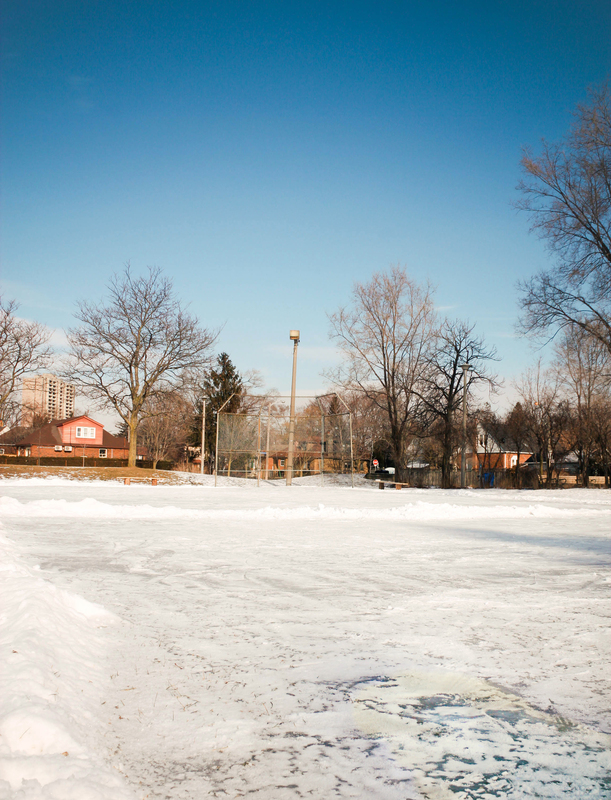 A new skating rink has recently opened at Denison Park and is accessible through Jane and Lippenscott, or Denison Road West. 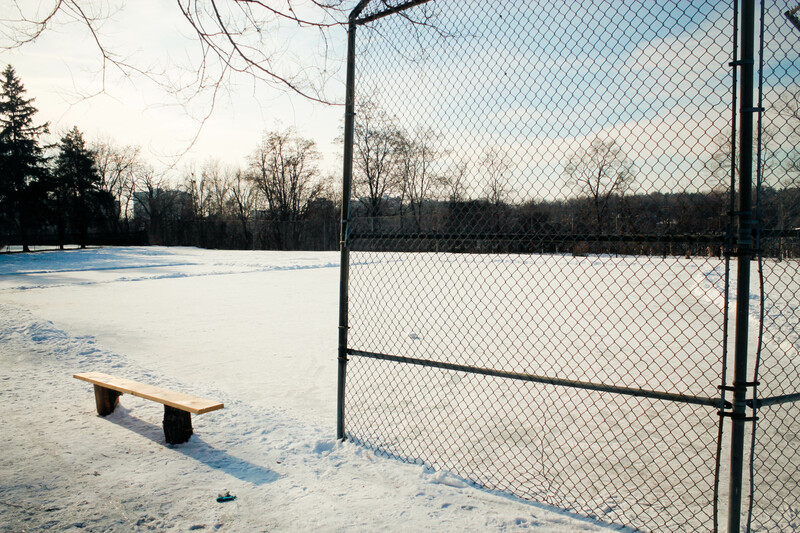 The rink is nestled behind the park’s playground, and a small corner is hugged by a metal fence, giving a perfect space for beginners. Being flanked by the Humber River and the sleepy, quiet Weston neighborhood creates the perfect mood to lace up and wind down. Unlike most city rinks, the Denison rink does not provide skate or helmet rentals, cubby space, or staff supervision – but unlike most city rinks, this one is particularly special. Homemade wooden benches in the foreground, Humber River in the background. Instead of being constructed by the City of Toronto, this baby is homemade. Several families living in the Jane and Weston community manually paved, flooded, and sucessfully obtained permit to what is now the beautiful Denison rink. With no zambonis insight, the maintence of this rink is truly a labour of love. As I hunkered down to the park, I spotted a few kids shoveling a layer of snow off the rink in quick, back-and-forth strokes while looking surprisingly agile for someone skating with a shovel. Completely unaware that I would be meeting the founding fathers, these young skaters turned out to be essential contributors to the rink’s very existence, and their families take tremendous care to upkeep it. A few from the founding team and their personalized ‘zamboni’. 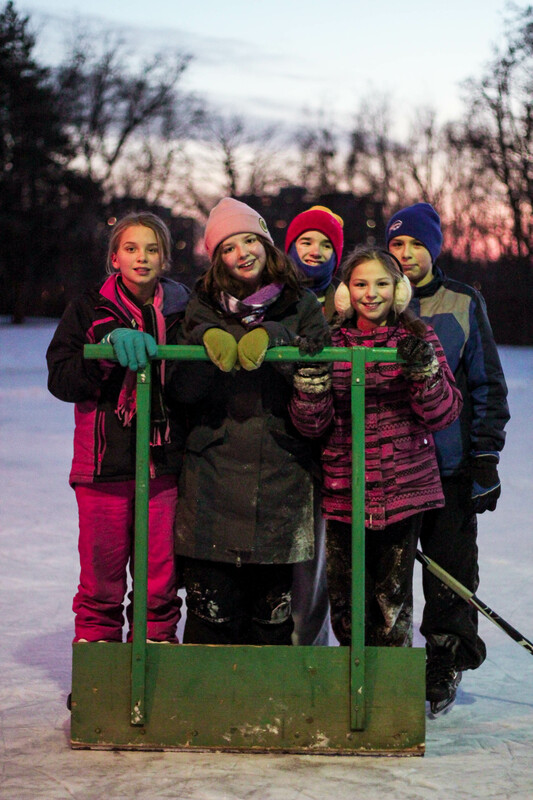 As described by one of the girls, Allison, the rink is regularly flooded at night and then finally smoothed over with their own personal ‘zamboni’. Whenever snow finds itself on the ice, it’s promptily cleared away. In fact, the rink’s facillities are all homemade, from the rustic wooden skating benches to the hand-drawn sign, beckoning community members to utilize the space. To the side of all this, a smaller section of the rink is seperated by a border of snow, hastily swept together by boots. When asked what this was for, one of the kids piped up that it’s reserved for slower, less skilled skaters. Young minds think of everything. Through petitions, hard work, and great effort from the several families’, what was originally a dirty puddle evolved into a functional, communal gift for the Weston and Mount Dennis neighbourhoods to enjoy. Buildling a rink is not an everyday DIY project. The community is definitely appreciating this new addition; curious dogwalkers came to inspect the rink and were overjoyed at the kids playing tag across the ice. Karen Hirji, member of the community, enjoying the ice. The Denison rink is a perfect example of how improving the community’s public facilities can be achieved not by only the BIA or city officials, but by small neighbourhood families, standing together and taking initiative. The Victory Community Credit Union, now at their new location at 2011 Lawrence Avenue West, Suite 11. Stop by and meet Weston’s best bankers!